NIGERIA — A Christian woman was recently held by Muslim terrorists in Nigeria and ordered to convert to Islam or die. 19-year-old Hajja told Reuters she was held by the group Boko Haram and told to renounce Christianity or perish. Members of Boko Haram threatened to slit her throat if she did not give up her faith in Christ. Hajja’s last name has not been released as she has family in northern Nigeria, who could be in danger if identified. She described the moment a knife was held to her throat, and her life threatened. Boko Haram made Hajja a domestic slave. She was forced to clean and prepare meals for the terrorist militia. Hajja’s testimony of captivity included Boko Haram using her as bait to lure civilian Nigerians working with the military into death traps. She witnessed Boko Haram militia slashing the throats of captured civilians. Hajja later managed to escape from her captors. She told reporters that it is hard for her to think about the ordeal. David Cook, a leading expert on Boko Haram and professor of religious studies at Rice University, told Fox News that the kidnapping of Hajja mirrored the pattern of “indoctrination, forced conversions, and kidnapping children” occurring in Nigeria over the past five years. “Just last week they kidnapped a French priest in Cameroon,” he said. Though totals of Boko Haram members are difficult to calculate, Cook estimated there were as many as 5,000. Boko Haram, which is translated into English as “Western education is sinful,” seeks to establish Sharia Islamic law into northern Nigeria. President Goodluck Jonathan, a professing Christian, has waged a military campaign against Boko Haram in an attempt to root them out, and has faced resistance from the group. 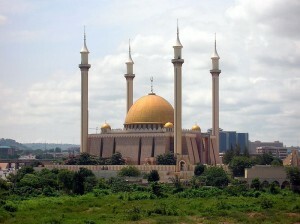 Nigeria is divided into a Muslim majority north and a Christian south. According to International Christian Concern (ICC), a Christian organization that records Christian persecution around the world, many girls in Muslim-majority areas of the country are being abducted and being forced to renounce their faith. ICC also records on their website the testimony of a man named Habila Adamu, who was shot in the head after he refused to deny Christ, but miraculously survived.